Have you ever had fickle friends? You know they get a plan going and invite you to go along. Your anticipation and excitement builds and then at the last minute they tell you that there is not room for you. Sorry. Sometimes people you love and grow to trust stop loving you. They change their mind about you and it hurts. It also leaves us with a new insecurity. People who have been abandoned, betrayed or just forgotten often have a hard time trusting. Ephesians 1 is a beautiful passage where we see this love of God directed toward us as something that is not going to change. The spiritual blessings God directs toward us through Jesus Christ are not temporary or changeable. We have been CHOSEN BEFORE THE FOUNDATION OF THE WORLD, we have "according to the good pleasure of His will" been adopted. I love the “good pleasure of His will” because that means that God wants us. It is not just a sense of duty but there is this divine enthusiasm to adopt us. We are also ACCEPTED in the Beloved. Acceptance is something we all long for. And so if God’s accepts me what more can there be. It may hurt when people don’t accept us, but somehow since God has accepted me I can survive. The rich language goes on and on in this passage. What I take away from this is a great sense of security in my relationship with God. He did not choose me on a whim that will pass. I am part of His eternal plan of the ages. This relationship I have with God is firmly established. I can trust and rest and rejoice in this. This is great stuff. 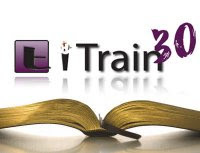 iTrain30 – I want to thank those of you who take time to offer a comment or just say that you are reading. This has been a great experience for me personally. There is something very amazing about having personal time with the Lord, knowing that others are there with me. The accountability and encouragement is great. If you have gotten sidetracked, I encourage you to jump back on board. If you are just beginning, welcome. This is a great devotion for me and my husband. We need reminders that God is with us and will take care of our needs. It's so easy to doubt and forget that He is there. This "miracle of adoption" is becoming so much more real to me. I think of the kids I taught for years. The respect I received came when they realized that I may not accept some of their behaviors and attitudes, but I always cared about them as individuals and wanted them to be certain they were as important to me as any other. day 9 complete, looking fwd to day 10, enjoying the readings, never approached it in this way, usually pic a book and go this is much more easy to digest even though I find myself reading too far at times. Sorry I am late to join, but day 9 is a great reminder. It is a good thing to be reminded not to lean on our own understanding..Seems when we don't understand is the time we turn to Him. Great reminder that it is an expectation and that He is there. That my eyes would be open to see what Christ would have me see. It reminds me of the song "Open The Eyes of My Heart". I pray that my eyes and the eyes of my family and the eyes of our church be open to see all that Christ has for us and all that he wants us to do. May we put feet to the path he has before us leaning on & trusting in Him. have read thru day 10. This is such an encouragement to me. I am loving everyones comments, and knowing that others are reading the same words I am, and we are each receiving what He wants us to hear from Him. Proverbs 3:5-6 esp. today. How long have I had those verses memorized, at least since grade school. And yet, I still need them as a constant reminder, to bind them around my neck, to write them on the tablet of my heart. To begin each day repeating those words...Trust in the Lord, and lean not on my own understanding...easy to say, not always so easy to put into practice!